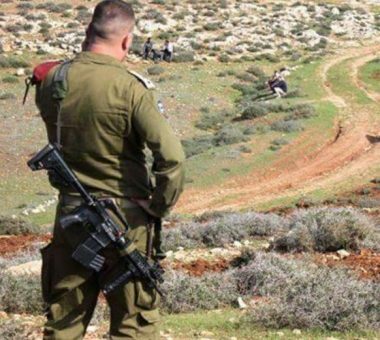 Israeli soldiers illegally confiscated, Tuesday, 24 Dunams of Palestinian land in Jabal Sbeih area of Beita village, south of the northern West Bank city of Nablus. Ghassan Daghlas, a Palestinian Authority official who monitors Israeli colonialist activities in the occupied West Bank, said the soldiers handed Beita Town Council a military order for the annexation of 24.5 Dunams of lands, owned by Palestinians from Beita and Qabalan. Daghlas added that the order cited “urgent military considerations” for the annexation of the Palestinian lands, and only comes a few days after the soldiers placed several mobile homes on the lands. The head of Beita Municipality Fuad Ma’ali, said the council was surprised by the military order, and added that the council was officially informed about the annexation by the Palestinian District Coordination Office after the latter was informed by its Israeli counterpart. Ma’ali said the Israeli order is illegal, adding that the council will counter it with all possible means.